Reference to the great urban folkmusic revival immediately evokes images of clean-cut and ebullient collegiate trios or quartets, intense and charismatic young folk poets with their hearts on their sleeves, nomadic troubadours singing for their suppers, dewy-eyed young women keening ancient ballads, long-haired and bearded musical prophets angrily calling for radical social change or predicting global apocalypse, life-scarred and hard-drinking bluesmen, and macho traditionalist balladeers propagating work songs or laments for old Ireland. For many of us (a significant sector of the so-called baby-boomer generation) the folk revival defines the 1960s. Bob Dylan, Donovan, Peter Paul & Mary, Joan Baez, Tom Paxton, Phil Ochs, Simon & Garfunkel, Odetta, Buffy Ste Marie, Pete Seeger, The Kingston Trio, even The Seekers: their music, more than any other, provided the soundtrack for our growing up. Against a background of global upheaval – political assassination, Civil Rights crusades, the war in Vietnam, the emergence of Women’s Liberation, men on the moon – listening to acoustic music in intimate coffee lounges, on radio or on treasured vinyl LPs and EPs, helped forge ideals, answered questions and determined our relationships. Time for Kings and Heroes examines the progress of the folk revival (or, alternatively, the first phase of the revival) as it occurred in Tasmania. Specifically, it records the preliminary glimmerings of public interest in folksongs in Hobart and elsewhere (parallel with folkmusic’s growing popularity as an entertainment medium on the mainland and overseas); the foundation of the state’s first formal folk coffee lounge, the Wild Goose; the evolution of a strongly American-influenced folk scene as other venues appeared in the south and north of the island (among them the Five Believers and Ad Lib, the Copper Pot and the Folk Inn); the peaking of folksinging activity in a spate of early festivals and concerts; and the emergence of a distinctive, home-grown singer-songwriter cult. It should be noted that Tasmania was a relatively late developer. The Wild Goose did not emerge until the end of 1964 and the stereotyped coffee lounge-style venue remained central to folksinging activity in Hobart and the north long after folk had moved into pubs on the mainland. Enthusiasm for this type of music also seems to have lasted longer. Clearly the state’s remoteness and insularity were decisive factors. Tasmania was the least sophisticated and most change-resistant outpost of a culturally-backward continent which changed dramatically (particularly in social terms) during the period under review. As Hobart historian Alison Alexander has noted, the 1960s witnessed a fundamental shift in values- “from wide acceptance of the Korean War to questioning the Vietnam War”, or from waltzes, barn dances and foxtrots to rock’n’roll and The Beatles. The old Bohemian dream changed: Sobranies and existentialism gave way to marijuana and left-wing idealism … [By the mid-60s] children born after the war, baby-boomers, were coming to university. Taking a prosperous society for granted, finding the old security boring, many agreed with those who criticised the failings of society: paternal authorities who told them how to think, middle-class hypocrisy and smugness, unfairness, injustice, discrimination. Causes such as opposition to the Vietnam war, Stalinism, imperialism and racism aroused them … The exciting new youth culture included sexual freedom with the introduction of the Pill; freedom of movement with more cars; freedom of lifestyle with more students in flats; plentiful stimulants, with beer and cheap wine in flagons joined by marijuana. It was the era of folkmusic, guitars, long hair, black eye-makeup and white lipstick, miniskirts, flared trousers, platform heels. Tasmania’s early folk scene, youth-oriented and student-based, emerged and developed within this context. I should note immediately that the term “folk revival” is problematic. Scholars are divided over (a) the accuracy of the term, and (b) the character and duration of the phenomenon. Melbourne singer and writer Glen Tomasetti has stressed, for instance, that before and after its period of mass popularity in the early ’60s, folkmusic continuously attracted a core audience. Other analysts, like American collector Jerry Epstein, see the activity of the ’60s as a mere prelude to the “real revival” of the last quarter-century. Folklorists Ralph Rinzler, Jacques Vassal, Robert Shelton, et al, strongly prefer the term “folk arrival”, indicating as it does urban awareness of music which had long been a vital factor in the lives of rural “folk”. Some scholars favour use of the term “folk boom” (even “folk fad” or “folk fever”) in differentiating the peak period when interpretations of folksongs headed AM radio play-lists from earlier and subsequent phases within an ongoing revival. Internationally, the scholarship of Francis J. Child in the 1890s and, subsequently, of collectors like Cecil Sharp, the Lomaxes, Pete Seeger, Lloyd & MacColl, preluded the performance and propagation of traditional music. Nurtured within Trade Union and left-wing intellectual circles as “the music of the people”, folksongs began to attract a mainstream audience after World War II, the movement gathering momentum during the 1950s. At the other end of the boom, from the late ’60s to the present, folkmusic in its many forms has maintained a solid minority audience of die-hard “40/50-somethings” while continuing to attract waves of younger performers and devotees. Some writers bracket the boom era with the chart success of The Weavers’ ‘Goodnight Irene’ (1950) and Bob Dylan’s final appearance at the Newport Folk Festival 15 years later. Some insist that the folk years began with the Harry Belafonte calypso craze or (more usually) with The Kingston Trio’s smash hit ‘Tom Dooley’ (1958), while others maintain that the real boom lasted only a couple of years (c1963-65). The redefinition of rock music at the hands of Dylan, The Beatles, The Byrds, etc., signalled a downturn in the mass popularity of folksongs per se yet audience cultivation of acoustic singer-songwriters like Paul Simon, Joni Mitchell or Leonard Cohen was clearly part-and-parcel of an ongoing folk process. For the purposes of the present study, I use the term revival to encompass the peak period of 1963-65, its precursors and its aftermath. At the same time, I concur with the view that what happened in the ’60s was the high point in what is a continuing process. The first phase of the revival was over in Tasmania by 1972 (significantly, the year that Gough Whitlam’s ALP routed the country’s entrenched conservative Government). Folk would be back with a vengeance a couple of years later, of course. The injection of energetic performers and organisers, recently arrived from Britain and Ireland, would herald a second (Anglo-Celtic) phase of the revival, a phase distinguished by ten years of the annual Longford Festival and the success of venues like the Bottom Pub, Salamanca Folk and the Bothy. Tasmania’s Anglo-Celtic heyday and the early Longford gatherings (advertised successively as the first, second, third Tasmanian Folk Festivals, and so on) are sometimes regarded, incorrectly, as the first true awakening of folk fervour in the state. While I fully acknowledge the importance, impact and popularity of that second phase, my aim here is to celebrate what preceded it. I approach the topic from inside, as a former participant fortunate enough to have witnessed a golden age at first hand. My first consciousness of folkmusic was seeing a travelling duo perform ‘A Hole in the Bucket’ during a children’s show at Launceston’s National Theatre circa 1960. (Somewhere along the line I learned that Harry Belafonte had made an immortal recording of the song). The next key event for me was seeing Peter Paul & Mary on the British TV show Hullabaloo. Mary tossed her long hair with artistic abandon and glorious intensity, and the two men pounded furiously at guitars, singing their hearts out on ‘Go Tell it on the Mountain’. I worshipped them from that point on. Around that time, my mother bought a little transistor radio and, in amongst the glories of British pop, I could revel in popular folk hits as diverse as ‘Don’t Let the Rain Come Down’ by The Serendipity Singers, ‘Green Green’ by The New Christy Minstrels, ‘Lonesome Road’ by Joe & Eddie, ‘Dominique’ by The Singing Nun, ‘The Love Come A-Tricklin’ Down’ by The Womenfolk and ‘Little Boxes’ by Pete Seeger. Danish duo Nina & Frederik appeared regularly on ABC TV. Bandstand aired PP&M’s Sydney stadium concert – over two weeks! (First hearing – and seeing – the trio do ‘The Times They Are A-Changin’’ by one Bob Dylan really “changed my life”). Then there was a wonderful Canadian TV series, Let’s Sing Out, and all the joys of browsing through record covers at Allans or Lloyd Campbell’s in Hobart. This led me to Joan Baez, Ian & Sylvia, Odetta, and the wonders of the Newport Festival. Pretty soon, I also realised that there were folksingers in Australia. Marian Henderson appeared weekly on Jazz Meets Folk. Lenore Somerset sang ‘The Ox Driver’s Song’ on the Adelaide-produced Country & Western Hour. Bandstand’s folkmusic specials exposed me to Sean & Sonja, Gary Shearston, Doug Ashdown, Brian Mooney, Judy Jacques and Tina Lawton. Closer to home, southern Tasmanians tuned in en masse to barrack for local girl Patsy Biscoe when she competed in the finals of Bandstand’s Starlight International talent quest. Another quest, this one beamed live by TVT 6 from Hobart’s Theatre Royal, was won by a male duo, Brownlow & Pickering, performing ‘Don’t Think Twice It’s Allright’. (Second place went to The Jones Sisters, rendering PP&M’s ‘Jesus Met the Woman’). 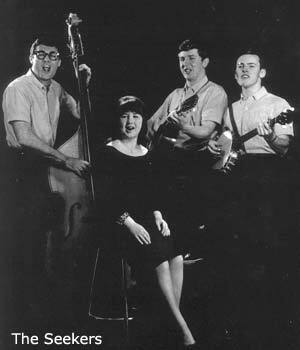 Shortly afterwards, Judith Durham, a former Hobart girl, shot to stardom internationally with The Seekers. My family’s move to the north-west coast coincided with the end of the folk boom but my passion for folkmusic continued to be fed by chances to play (a relentlessly bleak repertoire, I admit) at a coffee shop run by the Ulverstone Methodist Church, the Gateway in Devonport, and (later) the Napoli, the Folk Inn and the Brumida concerts. Along the way, I was privileged to meet and (in some cases) establish lifelong friendships with talented people like Guy Carey, Frank Povah, Neil Gardner, Suzette Salter, John Fulton-Stevens, Joe & Hetty Binns, Alex Tkaczuk (Myers), John Lavery, Mike & Jacquie Raine, Mal Brooks and David & Ian Paulin. All these years later I look back with pleasure and affection at the era and confess to mild amazement at the quality and diversity of what my peers achieved.